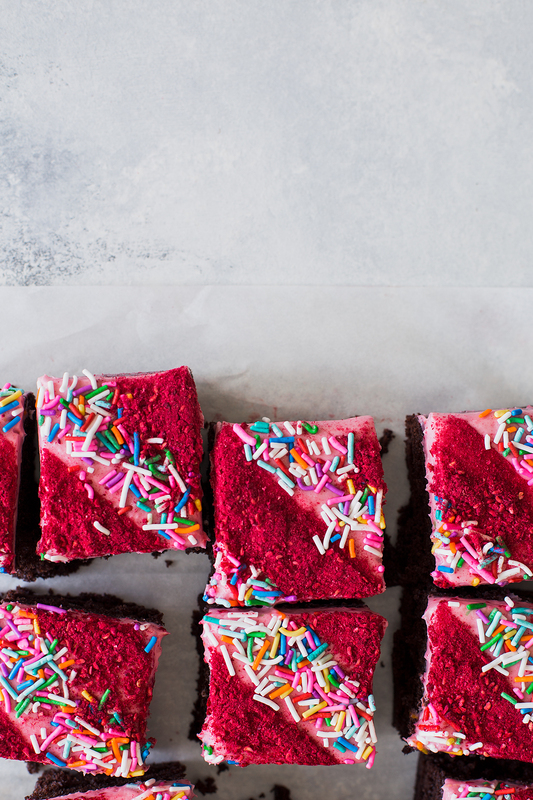 A dark chocolate cake perfect for snacking with a bright raspberry cream cheese frosting. HELLO! 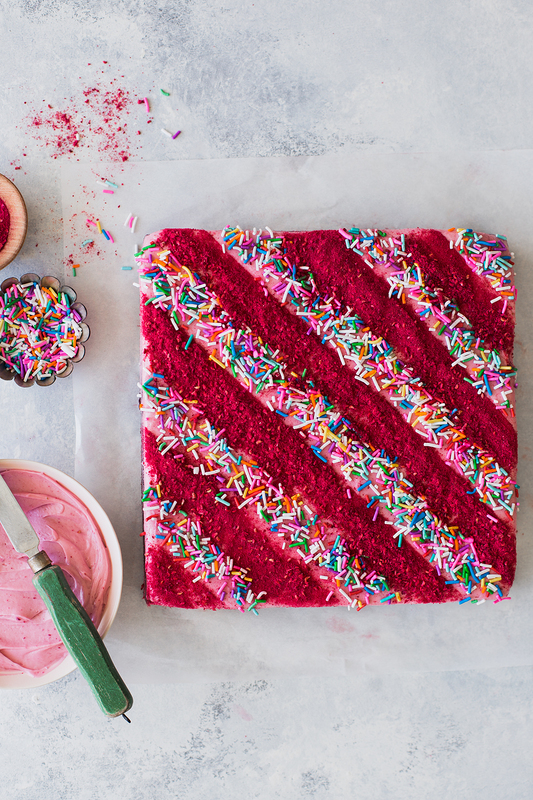 I am so excited to bring you this snack cake for a couple of reasons. June is officially a HUGE month for us because last Tuesday (6/5/2018) we welcomed our baby girl, Luna Violet, into this world! She is the sweetest little peach and we are all absolutely smitten with her. It was an emotional day, to say the least. The second I heard her cries I burst into tears. Then when my mom brought Casper by the hospital to meet his baby sister and he immediately fell in love with her (he tells her he misses her and asks about how she is constantly) and my heart melted into a puddle and it has yet to recover. It seriously may be the best feeling in the world and I may or may not be tearing up as I write this (spoiler alert, I totally am). Besides the huge new addition of our girl to the fam, it’s also my birthday this week, Father’s day, AND our anniversary next week. Needless to say, June is officially a BFD in this house. 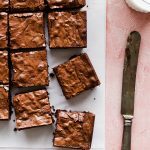 I made this chocolate snack cake a few weeks ago, while I was hugely pregnant and counting down the days until my due date. It uses the reverse creaming method which just means you beat the dry ingredients with the butter until it’s sandy, before adding all the liquid ingredients. This method results in a cake that has an incredibly soft and fine texture that’s both dense and tender. It reminds me of something between the texture of a pound cake, minus the heft, and a classic fluffy cake. The frosting for this cake is a star on its own. 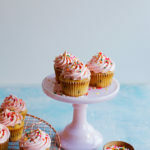 It’s a tangy cream cheese frosting that’s blended with freeze-dried raspberry powder, which is a great trick for making a fruit-flavored frosting without adding any additional liquid. 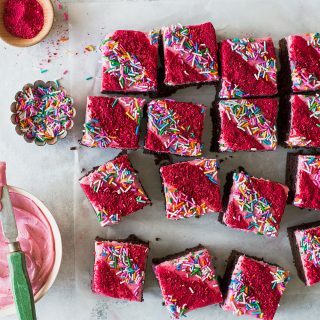 The raspberry powder packs a huge punch of flavor and makes this frosting naturally bright pink. 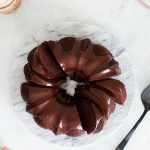 It pairs beautifully with this dark cocoa cake, but I also think it would be a great frosting on vanilla cupcakes or even a funfetti cake! Soften your butter! Since we are blending the butter into the dry ingredients, soft butter is key. You should mix the butter into the dry ingredients until it’s completely combined, however long that takes (it takes me about 4 minutes on low speed). The mixture will resemble wet sand and there should not be any chunks or pieces of butter left in the mixture. Once it’s all mixed, you can add the liquids in two stages. I do this in two stages to make sure everything is well blended and there aren’t any pockets of dry cocoa or flour left. Dried berries equal more flavor! If you’ve ever had freeze-dried fruit before you know just how vibrant and punchy the flavor is. Since there isn’t any liquid left in the fruit, the flavor is super intense. 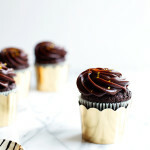 This makes for a super flavorful frosting and one that isn’t runny from the addition of fruit juices. I find freeze-dried berries at Target and Trader Joes. Room temperature cake just tastes better. It’s especially true with butter cakes like this one. 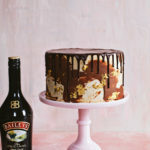 You can refrigerate this cake to make it last longer, but serve it at room temp for best texture and flavor. Since butter is solid when it’s cold, this cake become firm and crumbly when it’s refrigerated. 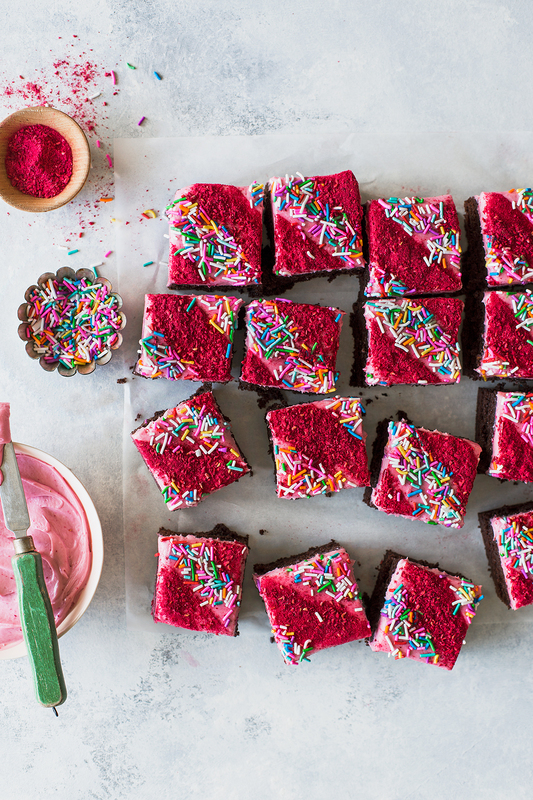 Plus, chilling cakes dulls the flavor. Simply let it sit out at room temperature for a few hours before serving. The butter in the cake will soften, the texture will improve, and the flavors will be more pronounced. Preheat the oven to 350°F. Grease and line an 8x8-inch baking pan with parchment paper. In the bowl of a stand mixer (or using a mixing bowl and hand mixer) combine the flour, sifted cocoa, baking powder, baking soda, salt, and sugar. Add the softened butter and beat on low until you reach a sandy texture and all the butter is combined. In a large measuring cup, whisk together the buttermilk, eggs, and vanilla. Beat half of the buttermilk mixture into the dry mixture until combined, before incorporating the remaining buttermilk mixture. You should have a smooth batter. Scrape the sides and bottom of the bowl and fold in any remaining dry bits. Spread the batter into the prepared pan and smooth the top with an offset spatula. 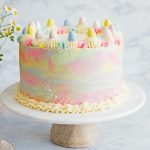 Bake in the preheated oven for 30-35 minutes, or until a toothpick inserted into the center of the cake comes out clean and the top of the cake springs back to the touch. Remove from the oven and cool completely on a rack before frosting. While the cake cools, make the frosting. Beat the cream cheese in the bowl of a stand mixer (or in a mixing bowl using a hand mixer) until smooth. Beat in the butter until smooth and combined. Scrape the bowl and add half of the confectioner’s sugar, beat for about 1 minute until fluffy. Scrape the bowl and beat in the remaining confectioner’s sugar for an additional minute. Scrape the bowl again and beat in the raspberry powder and salt until combined. Scrape down the bowl one more time and beat for an additional minute. Spread or pipe the frosting over the cooled cake (turn the cake out onto a platter or board to frost the sides, if you want). So so excited for you and your growing family! What a month indeed! 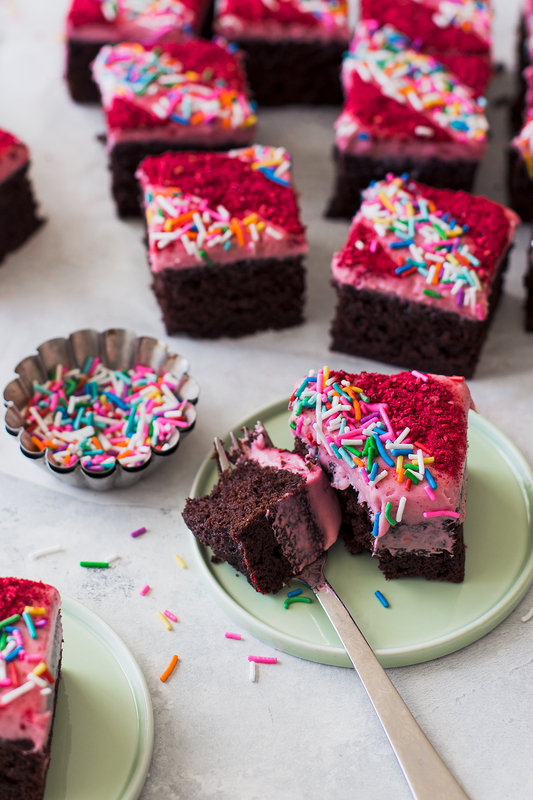 And what a beautiful, electric pink cake. Love it! yayyy!! have been waiting for this :) her birthday is 4 days before mine <33 what a beautiful name she has! So attractive ! Perfect for children ! Thank you so much ! Gorgeous cake, love the vibrant colours! Massive congratulations on the birth of your daughter, love the name! Sibling love is so adorable, I have a 3.5 year old girl and nearly 1.5 year old boy and watching them dote on each other makes all the other times when they’re fighting over toys all worth it! thank you! It’s been so sweet to watch them together!